New Santa Ana | Santa Ana City Place sign twirler hit by car, on Main St.
Santa Ana City Place sign twirler hit by car, on Main St.
As I was driving home on Friday, south on Main St., I wondered why the light was out at the intersection of Main and Town and Country – and why there were so many police around. It turns out that an out of control car hit a man twirling a sign advertising Original Hems, a tailor at the City Place shopping center. “An older man was driving the Mercury south on Main Street just after 3 p.m. Friday when he lost control near West Town and County Road, said Cmdr. Jeff Owens of the Santa Ana Police Department. 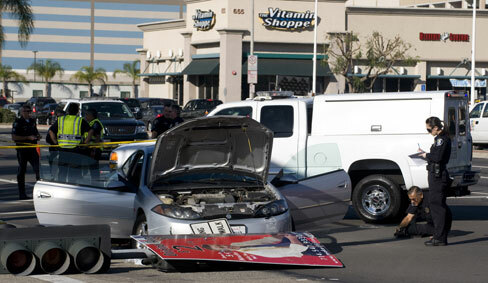 A sign twirler working on the sidewalk was hit by the out-of-control Cougar and ended up pinned underneath the car, Owens said,” according to the O.C. Register. There are some folks in Santa Ana who are entirely opposed to sign twirlers. My concern is for their well-being. The unfortunate sign twirlers have to stand for hours at a time, twirling signs. That cannot be good for them, ergonomically speaking. This work could lead to neck and back problems. Moreover, they are exposed to the elements. They could get skin cancer if they don’t use sun block. They could also succumb to heat illness. They do all of that for minimum wage. And most likely they don’t get benefits. Cal/OSHA should be looking at this problem – but they aren’t. At the very least our local legislators should speak up on behalf of the sign twirlers. I hope the poor man who was hit on Friday will be okay. But being hit by a car is a major traumatic accident. And he probably won’t be able to fully recover. All of that to advertise a tailor…in retrospect it just wasn’t worth the few shekels the poor victim received for his labor. I see those guys everyday since this location is near my home. It’s a horrible problem. Of course, when you have a business that is hidden inside a shopping center, it is difficult to advertise. This type of solution is creative, but actually a very sad commentary on our society. Imagine how it feels to take a job that could actually be replaced by a wall or an easel. I’m actually relatively certain that these jobs are under the table types of jobs. Unfortunately, the more we all complain in the name of the poor person holding the heavy sign, the higher the chance that he or she will end up completely unemployed. I don’t know the answer. Employers have a duty to provide a workplace free of recognized hazards, as per OSHA rules. At the very least these workers should be wearing safety vests. And they should receive general safety training. Cal/OSHA needs to act to protect these workers. I do feel bad for the shops at the City Place. They have very little foot traffic and many are hurting. I talked to the man who did the sign twirling last week to find out the tailor’s business location . I sure hope the car owner is carrying a boat load of insurance so he can pay the damages incurred by the sign man. If the man was employed by a company, this injury will also be treated as a worker’s comp case. The worker’s comp insurance carrier will then go after the driver’s insurance to recover their losses – which figure to be major. Yes, their well being is a concern. Sign twirlers so often get too close to the curb and block the view of traffic. As much as I want to see people employed, there has to been some regulation for safety of twirlers and drivers.